Could this be a replacement for fixed broadband? 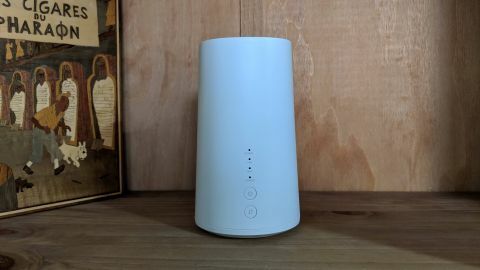 You cannot buy the Huawei router separately from the Vodafone service, but as a bundle, the Vodafone Gigacube works well – though your mileage will vary, as performance will ultimately depend on your location. After years of timid launches and half-baked products, mobile networks are set to confront fixed broadband providers head-on in 2019 and 2020 with better and more resilient 4G coverage, as well as an expanding 5G network. Already Three has signalled its ambitions by acquiring Relish Broadband, and now Vodafone has unveiled Gigacube, a new mobile router that targets both consumers and business owners. The Gigacube is what Vodafone has christened the more forgettably named Huawei B528s-23a, a device that’s almost two-years-old. Vodafone doesn’t even try to hide the fact that this is first and foremost a Huawei product. There’s a big Huawei logo on top and there’s no mention of Vodafone, or Gigacube for that matter, anywhere. The router is essentially a white cylinder which looks like a distant relative of a Glade automatic spray bathroom freshener. It’s made of plastic – no surprise there – and has four status lights on the front (signal, LAN, Wi-Fi and power), along with power and WPS buttons. At the back is a flap that covers two connectors to hook up an external antenna as well as a phone socket (unused), a Gigabit LAN/WAN port and a proprietary power connector. Underneath you’ll find a SIM card slot (Vodafone pre-populated it with a data SIM with unlimited data for testing purposes) and all the details of the default settings (two SSIDs plus Wi-Fi key, as well as the login and password for the admin panel). Mobile hotspots usually have a battery to give them true portability, while portable routers have to rely on mains power. The latter, however, is likely to have a better range due to the size of its antenna and the power of its transmitter. The Gigacube doesn’t contain any batteries and it is a shame that due to the proprietary nature of the connector, you can’t use a portable mobile battery to power it – that would have opened up new possibilities. Its power adaptor is a 12W (12V, 1A) model, which could have been substituted for a 5V, 2.4A model. As such it is a portable rather than a mobile 4G router. You can connect up to 20 devices to the router at any one time and Vodafone claims that you will be able to reach speeds of up to 300Mbps as this is a Cat 6 LTE device. The reality is different and will depend on your location (ours is somewhere in Bedfordshire): we managed to get an average of 23/14Mbps, using Netflix’s Fast.com, 31.78/16.85Mbps on Speedtest.net, and 29.5/14.6Mbps using Google’s own speed test. All numbers are for upload and download speeds respectively. Latency was average at around 40ms. Vodafone has a “useful” network status checker, and we apply the quote marks because it stated that expected 4G upload and download speeds could be anything between 0.9 to 23.2Mbps and 3.8 to 60Mbps – not what we’d expect from LTE! Note that this is a dual-band device with a 2x2 MIMO antenna setup for better coverage. There’s even a free Android mobile app (Huawei Hilink) that allows you to view the status of your mobile broadband device and manage its network connections. As for its web-based user interface, this can best be described as prosaic, providing the bare amount of features, but at least in a straightforward manner. There’s a VPN, the ability to configure a virtual server, DMZ, UPNP, parental control and more. Relish Broadband has stopped taking on new customers as the firm is overhauling its infrastructure following its acquisition by Three. The latter now offers the Huawei HomeFi with unlimited data for as little as £22 per month on a two-year contract. You can connect a maximum of 32 devices at any one time, far more than the competition. O2 has the Pocket Hotspot Pro Netgear M1 which it claims is the world’s fastest pocket hotspot and one which can connect up to 20 devices at once. 60GB of data per month over three years will cost you £29.84 including VAT. EE’s 4GEE WiFi hotspot has a 50GB per month data allowance over two years for £30 per month including VAT. The Huawei-sourced device hasn’t been tested yet, but, like the M1, it can connect up to 20 devices and has an inbuilt battery. BT, which owns EE, uses the Mini Hub BT70 as its sole 4G hotspot. At £22 per month excluding VAT, it is also the most expensive of the lot, delivering only 30GB per month on a two year contract. On the plus side though, you have access to unlimited BT Wi-Fi and you can use your plan in the EU. For more flexibility and a shorter contract, you could nab a SIM from Three and shove it in an old mobile phone, using the latter as an emergency phone and a mobile Wi-Fi hotspot. A SIM with unlimited minutes, data and text plus roaming in countries such as Hong Kong and Australia costs as little as £20 per month (at the time of writing). Vodafone is one of the more affordable mobile broadband providers on the market and offers the shortest contract length of the big four. 60GB per month on an 18-month contract costs only £35, up to 300GB a month for £80 – but that’s almost four times what you’d pay with Three and its Huawei HomeFi. Although that is a moot point if you can’t get good Three connectivity where you are – there are still some not-spots despite the 99%+ 4G network coverage promise put forward by the big four mobile networks. As for the Huawei B528S-23a, it is a decent mid-range router, but it doesn’t have a second LAN port or an internal battery. We’d love to have a microSD card slot, an additional SIM slot, or a USB port to plug in an external storage device, plus some sort of money-back guarantee to allow users to test the service before fully committing. We’d also like to see a mobile 4G router with an antenna that doubles as a secondary battery, one which would offer much wider coverage and several days’ worth of battery life. Any takers?